Court physician to King Sigismund I. of Poland; son of Abraham of Jerusalem; died at Kazimierz, a suburb of Cracow, about 1510. He was recommended in 1504 to King Alexander Jagellons by Archbishop Andreas of Gnesen, whose court physician he had been. On the archbishop's recommendation, the king permitted Isaac to purchase from the heirs of Frederick of Olmütz, formerly surgeon to King John Albert, the right to the taxes of the Jews of Cracow, which amounted to one hundred Hungarian florins per annum. For this privilege Isaac paid the heirs the sum of three hundred florins. In order to disprove the taunts of the Jews of Kazimierz, who had ascribed to him a humble origin, Isaac persuaded two Polish noblemen, Jacob Wagorzowski and Thomas Czarnycki, who were setting out to visit the Holy Sepulcher at Jerusalem, to secure his pedigree ("yiḥus") from his sister Sarah, resident in that city, as written evidence of his descent from a family of undoubted antiquity. His friends accordingly returned to Isaac with the required documents. King Sigismund evinced great interest in the matter, as appears from a decree dated Cracow, May 12, 1507, embodying the facts in regard to Isaac's lineage. 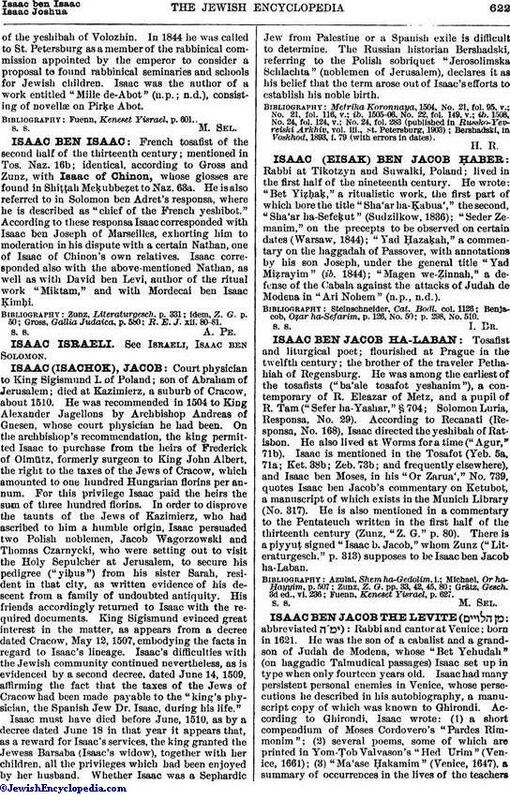 Isaac's difficulties with the Jewish community continued nevertheless, as is evidenced by a second decree, dated June 14, 1509, affirming the fact that the taxes of the Jews of Cracow had been made payable to the "king's physician, the Spanish Jew Dr. Isaac, during his life." Isaac must have died before June, 1510, as by a decree dated June 18 in that year it appears that, as a reward for Isaac's services, the king granted the Jewess Barsaba (Isaac's widow), together with her children, all the privileges which had been enjoyed by her husband. Whether Isaac was a Sephardic Jew from Palestine or a Spanish exile is difficult to determine. The Russian historian Bershadski, referring to the Polish sobriquet "Jerosolimska Schlachta" (noblemen of Jerusalem), declares it as his belief that the term arose out of Isaac's efforts to establish his noble birth. Bershadski, in Voskhod, 1893, i. 79 (with errors in dates).